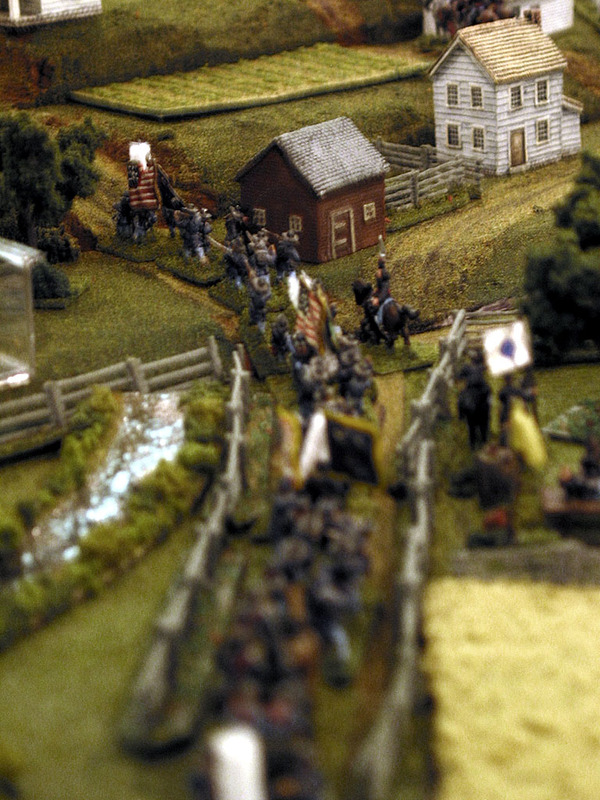 Robert Sweeney, a member of the Johnny Reb Gaming Society, is taking a survey of regimental-level ACW gamers. Please respond here with your answers. 1) How many Union infantry regiments (not counting cavalry, artillery or special units) do you have painted, mounted and usable for battle? 2) How many Confederate infantry regiments (not counting cavalry, artillery or special units) do you have painted, mounted and usable for battle? 3) How many Union cavalry battalions do you have painted, mounted and usable for battle? 4) How many Confederate cavalry battalions do you have painted, mounted and usable for battle? 5) How many Union artillery batteries do you have painted, mounted and usable for battle? 6) How many Confederate artillery batteries do you have painted, mounted and usable for battle? Thanks! I will compile results from TMP and other sources and report the overall results and averages on the Johnny Reb Gaming Society’s Charge blog. I have a Corp each of Union and Confederate 15mm troops including infantry, Cavalry, guns. Special units include an indian regt, colored regt., sailors marines, shore batteries, ironclads, and various terrain items. d) Wagons: 40 but never used/seen on table for many years as they no longer have a function in the game unless as decoration. Remember, the REAL war was out west in the Trans/Miss.. everything else was a boring diversion! Ha.. look at that.. my 8 ) turned into a smiley. I have a corps plus a few extra regiments for each side. I’m working on command stands with all Western Theater flags for the CSA to be able to interchange with the ANV regiments. I have a small regiment of Union sailors, and a battalion of US sharpshooters. Only have a brigade of cavalry for each side, but do have 4 wagons per side, which can make for a fun wagon train scenario. Have at least a dozen batteries and limbers per side. There’s a brigade of US Colored Troops and a brigade of Union Zouaves. The Yanks have one regiment of 8 figures per stand, and both armies have several 6 figure per stand regiments. The Rebs have several 2 figure per stand regiments. The rest are 3,4, and 5 figure per stand regiments. It’s a real mix. I also still use 5 stands per regiment because I strongly believe the longer length of each regiment’s battleline is important visually and better replicates CW linear tactics within the JR rules. Order my book from amazon.com! Making your battlefield terrain look better! FREE rules for ACW wargaming - Give Them the Cold Steel! Gettysburg Miniature Soldiers' expanded store! Johnny Reb 3 rules rewritten for clarity!! !